I said in my last post that I wouldn’t go down the daily diary route. I don’t know what’s come over me tonight but I want to remember today and the way it has made me feel so I’m going to experiment. I think I’m going to start backwards. I’m currently at my kitchen table, I’ve just made a cup of tea, I’ve opened the box of chocolates my husband has left for me (he’s gone away for the week), I can hear the Tawny Owls in the garden, and it’s just that time where I’m starting to think I should really be in bed. Toddler bedtime was gorgeous tonight. He snuggled into his cot and said ‘love you’ (he’s never said this before) and then followed it with ‘never far away’. That’s me, you see. I’m never far away AND I always come back. We enjoyed a looooong read of Lucy & Tom at the Seaside, Night Time, The Very Hungry Caterpillar and a mammoth recital of Bedtime Rhymes. Bath was as splashy as ever. I have instructions every night to throw the flannel high into the sky. There’s a surprising amount of skill required to ensure it is thrown high enough for a good splash but without it hitting the ceiling and veering out of the bath. No flannel flying until the bath-time banana is dispensed with though. My son has a huge amount of affection for fruit and vegetables but not a lot of inclination for eating them. A banana in the bath is my last point scored in the 5-per day battle, or is it supposed to be 7-per day…? Ok the next/previous bit is a bit hazy…we tidied up and threw stuff around, we made some phonecalls, we trod on a toy tractor (and cried), we drew, we played, we watched CBeebies, we wondered why Big Barn Farm wasn’t on (and cried), we had snacks, and we tried to get warm and dry. Just before being coaxed inside with the promise of CBeebies and the hope of Big Barn Farm we had been roaming the gardens and puddles of our road. I was cleverly dressed in wellies, cardi, jumper and raincoat. 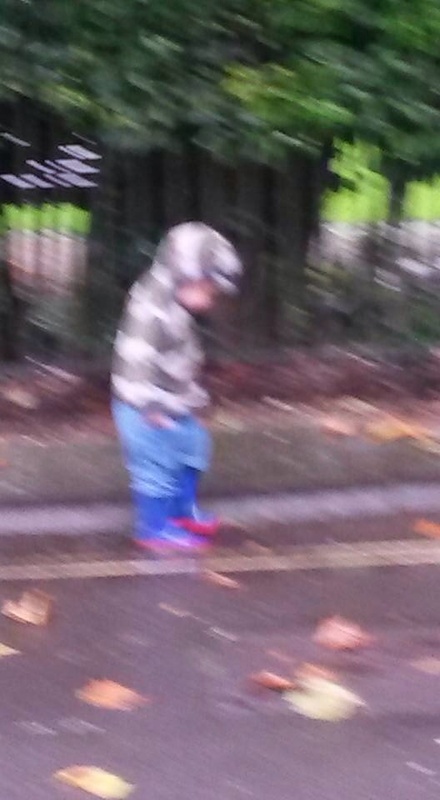 My son, not so cleverly dressed…wellies yes but then just a t-shirt and hoodie thing. Once I’d realised my caring parent fail the sky was quite dramatically falling but we were too far from the car-drobe to change tack. We’d reached the back garden, the ‘wild garden’. This is a magical shared space with winding paths, a pond, trees, a shed, lots of hiding places and all manner of flowers, herbs, vegetables and fruits. We have a gate from our own garden that goes directly into it. It’s our very own badly-kept-secret secret garden. Today it was important that we ‘look it’ everything. 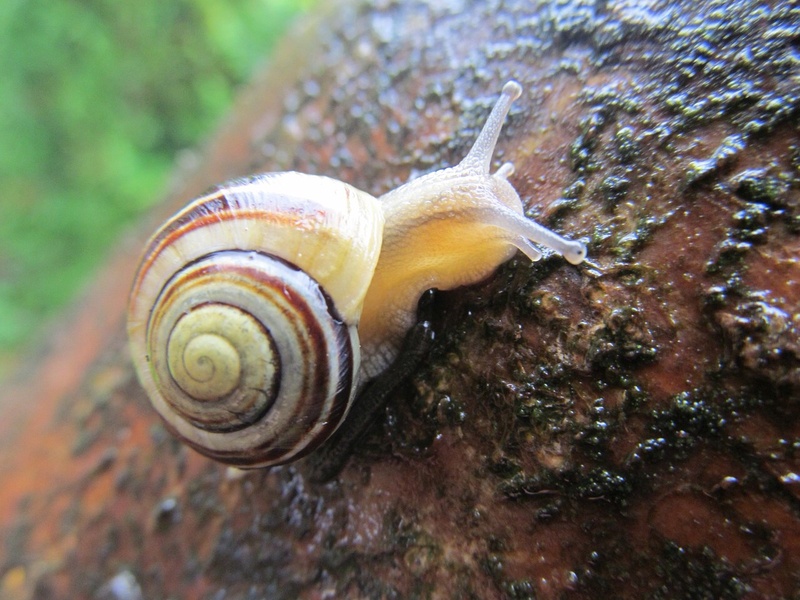 We also found lots of sparkling wet spiderwebs, and happy wet snails. We also had to smell EVERY flower. Quite the sweetest sight I’ve ever seen was my boy bent completely double to smell a dandelion in the pouring rain. The rain was inconsequential, we were wet anyway from our previous activity of SWIMMING. Ok this is almost certainly not fanfare enough to warrant a blog post for most people but let me explain. We don’t go SWIMMING. We never thought signing up to weekly baby swimming classes was a good (or economical) idea and then I just don’t know where the months/years went. Oops. Anyway, despite initial reluctance at home ‘no swimming, don’t want it’ (him not me) we pressed on. It was utterly brilliant. My son is such an easy bod to be out with now he can stand on his own two feet (literally)…no faffing with changing tables, carseats, and suspect changing room puddles. Once I’d cut the labels off my cozzie and squeezed him into a swim nappy two sizes too small, he had a wonderful time peering under the changing room wall at people passing by before launching himself into the baby pool. I found it a surprisingly wonderful bonding activity, we had embarked on this adventure together! But also the physicality… my son isn’t super-cuddly, rarely naked now the weather has turned (!) and hardly ever sleeps in my bed anymore. Today it was so nice to be face-to-face to him for most of the swim time and to feel his little body so close as he climbed on me, jumped on me, and held on to me. I’m so glad the morning’s persuasions got us both out of our comfort zone. And now I’ve landed on why today felt so lovely I think I’m going to leave it there. We’re almost at the beginning anyway. I might keep experimenting with what I put on my blog. Maybe one day I’ll even start taking amazing photographs. Pah! Unlikely. < Previous What’s it all about? Aah I love a diary post! So interesting to hear about other people’s days. Sounds like a lovely day. You have given me some warm feelings with which to start my day! You have a lovely evocative writing style. I love the blurry picture, It makes the story human and personal and made me laugh. Such a lovely day. Having had my three in such quick succession I do sometimes feel like I’ve really missed out on the just hanging out together days a bit. Ah I’m glad my dreadful photography skills are amusing for you…! Your point is really interesting…that’s definitely something I think/worry about with having a second actually…and the extension of that about not spending as much time with either ultimately but then being a sibling is extrememly special and siblings have different but just as lovely experiences. My son is missing out on that a bit at the moment. We can’t win! Haha! Sounds great! Yes, well if I had to write one today it would definitely look a lot like that…i could probably do a pretty detailed CBeebies review though so every cloud…. I have made many attempts to keep a written daily journal but have failed miserably and sometimes my days are just utterly too boring to write about lol. Thank you for sharing with #momsterslink. I know what you mean, I’m definitely not cut out for it daily but maybe the odd day here and there. Depends if I get to the end of the day cursing or smiling!